I am well into my Christmas crafting! I have so many projects that I want to complete for ebay and two custom orders -- yikes. Hope I can fit it all in before Christmas. All my shopping and decorating still needs to be done as well (I better get moving). Anyway, I wanted to take a minute and share two listings I have this week on ebay. The first is this adorable mini album titled "Believe" -- you can see the entire book here. 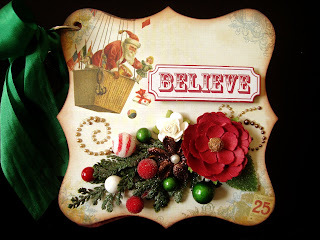 I just love this vintage style paper from Pink Paislee... their products do not disappoint!! The next is this layout that I created with Webster's Pages paper, another wonderful company with the most amazing papers! 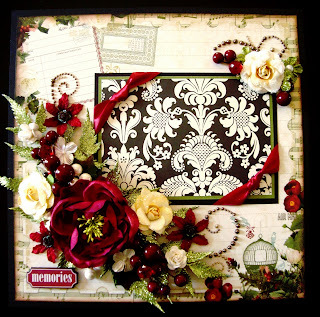 I have added beautiful Prima flowers, berries and some glittery leaves -- this layout makes me happy :-) See more photos of it here. I will be posting more items in the coming weeks, keep checking back! I hope everyone has a wonderful Thanksgiving!!! Hi Sam! Just wanted you to know that I nominated you for the "Sylish Blogger Award" on my blog! Hop on by and check it out! time for some green and red!